Use one sachet for your coffee machine and the other for your kettle: with this handy twin pack, you can descale your appliances in an environmentally friendly way using pure citric acid! Without limescale, your appliances will last longer, consume less energy, and be more hygienic. Limescale significantly impairs the performance of hot water appliances and attracts germs and dirt. 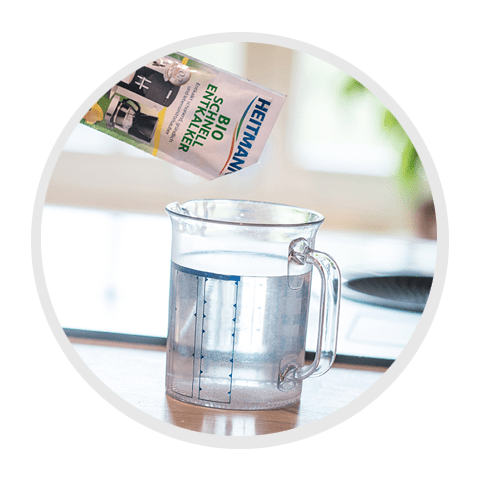 HEITMANN Bio Power Limescale Remover dissolves limescale powerfully in a food-safe and environmentally friendly way. The product is suitable for all coffee machines (pod, capsule, or espresso machines and fully automated coffee machines) as well as for electric and traditional kettles, egg boilers, and hot water appliances. The citric acid in the product is manufactured using natural raw materials and is fully biodegradable. Powerful, efficient, clean—harness the impressive power of nature with the Bio Power Limescale Remover. Pure citric acid is fully biodegradable. Dissolve the contents of one single-use sachet in ½ litre of water. Add solution to appliance’s water tank. Switch on the appliance and allow it to run through, or heat up the solution. After descaling, rinse the appliance by refilling twice with water. Descale two appliances at the same time with the handy twin pack. Attention Causes serious eye irritation. Wash … thoroughly after handling. Wear protective gloves/protective clothing/eye protection/face protection. IF IN EYES: Rinse cautiously with water for several minutes. Remove contact lenses, if present and easy to do. Continue rinsing. If eye irritation persists: Get medical advice/attention. If medical advice is needed, have product container or label at hand. Keep out of reach of children.